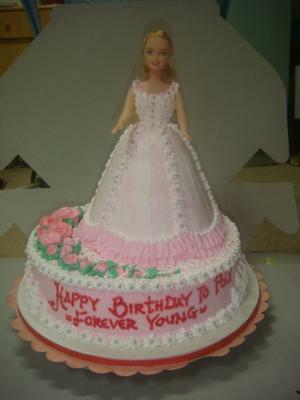 For this Barbie cake, I baked 2 cakes, one 11" round and one 11" square. The round cake was for the base while the square one I used to form a Barbie's skirt. I made it very simple. I only used fresh cream for the icing right from the topping to the decorating part + sugar beads ... yes, it was only a fresh cream icing. The cake was ordered by my 36 yr old female friend.